I've always felt lucky having grown up in Florida. It's a place that people from all over the world come to for vacation, and I grew up with one of the most beautiful beaches in the country right in my backyard. 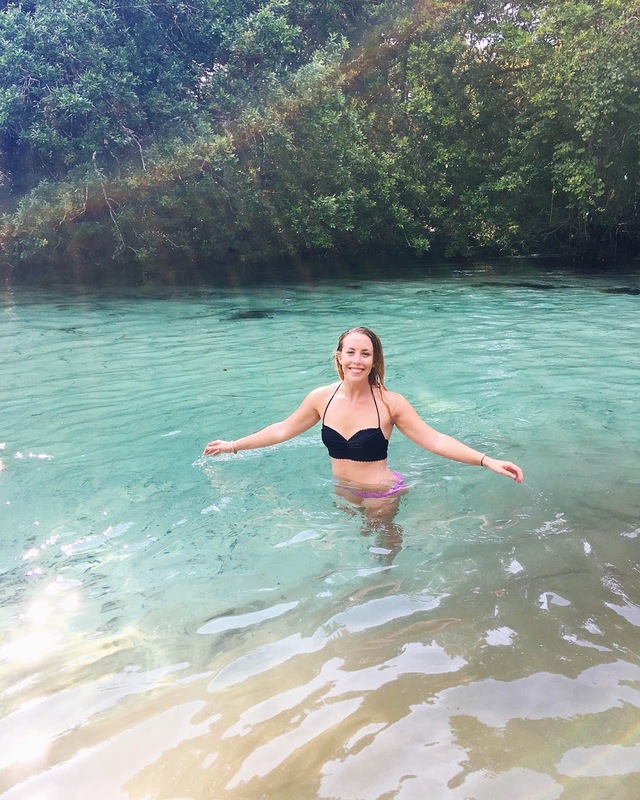 While I've never experienced a true change of seasons, or the real magic that happens when you sip a pumpkin spice latte on a crisp October day ("crisp" is a word we reserve to describe the weather during a day or two in January), I've always had white sand beaches, crystal clear waters, and Disney World at my finger tips. Having said all that, there's a whole lot of Florida that I haven't discovered yet. 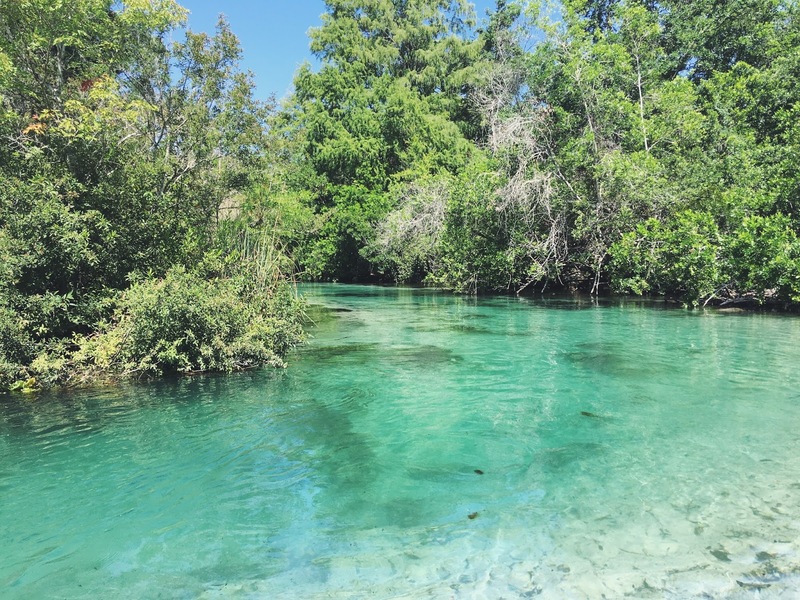 This state has so many beautiful state parks and springs that I just haven't gotten around to visiting, so when my good friend Brittany decided to have her birthday celebration at Weeki Wachee Springs this past weekend, I checked any reservation at the door and forced myself (and Ryan!) to sign up for the adventure! Saturday morning, we left at 6:15 a.m. and watched the sun rise during our hour and fifteen minute drive to the springs. Shortly after announcing "it isn't supposed to rain until 2! ", a storm formed completely out of nowhere right where we needed to be. Thankfully, the storm only lasted about 30 minutes, and we all piled into a couple vans to take us to the top of the river. 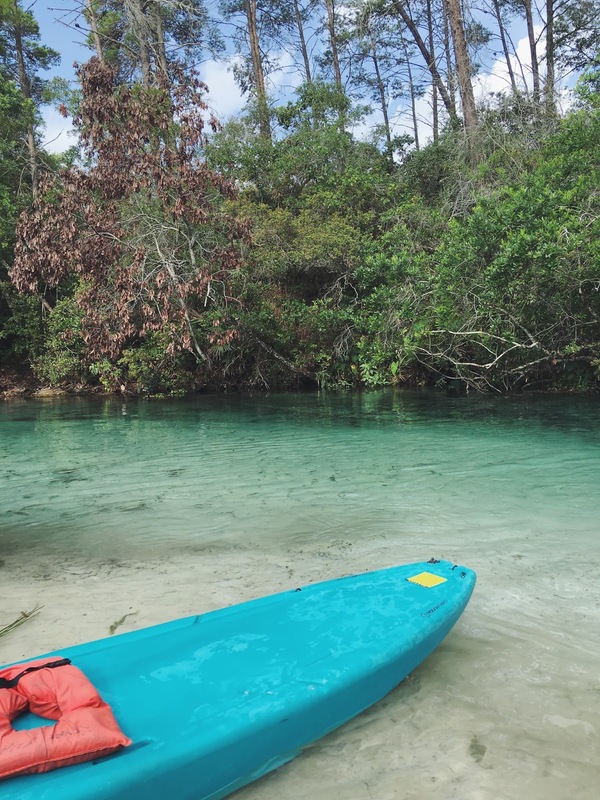 We had the option to rent canoes, single or double kayaks, or paddle boards. We did our rentals through The Kayak Shack, and it was only about $35-40 per transportation (so only $40 for two people on a double kayak, but it was $35 for me on a paddle board and $35 for Ryan on a single! ), and that also includes your launching fee from the river, parking, and transportation of your canoe/kayak + yourself! Overall, I think it was a pretty good deal. From the launching site, you have about 5.5 miles of river to trek through, and I'm not lying when I say every inch is absolutely beautiful. 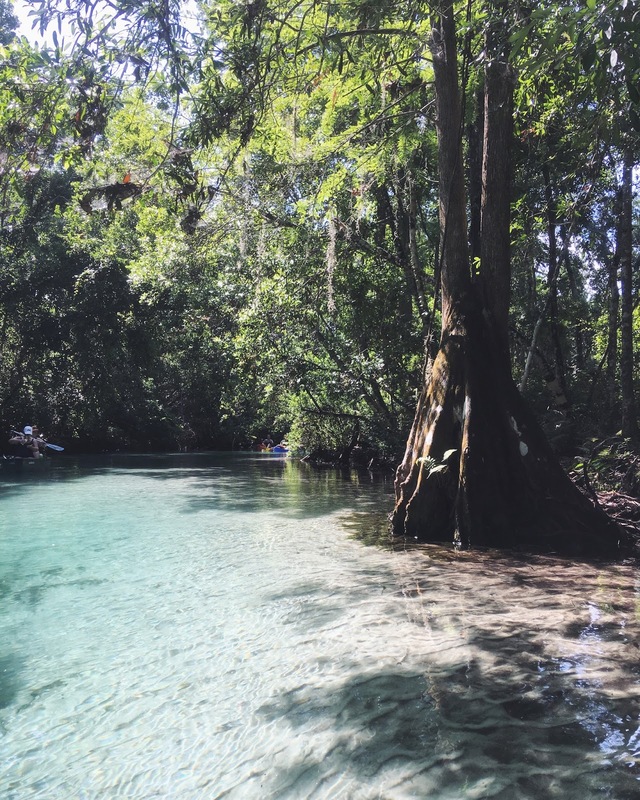 The water is crystal clear, so you can see all sorts of wildlife below. Some were even lucky enough to see manatees! Unfortunately, we weren't some of those people, but we did see plenty of fish! 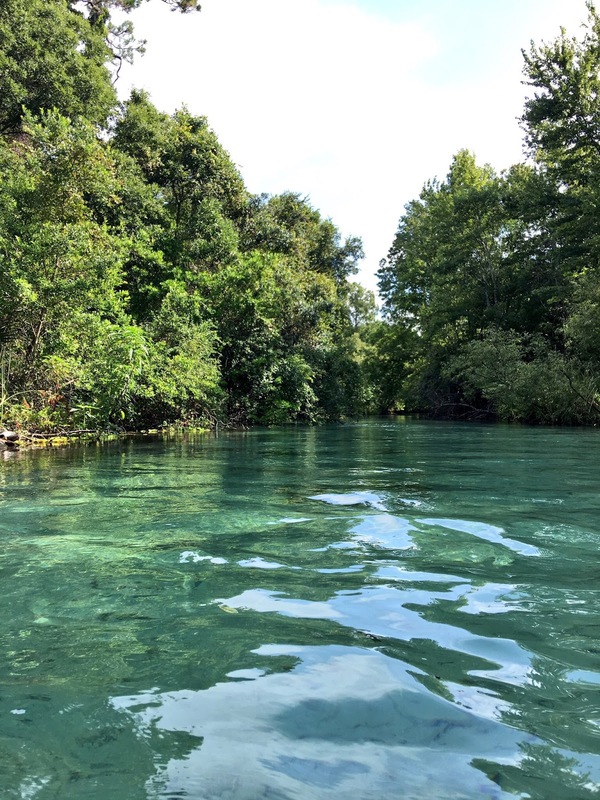 Throughout the river, there are plenty of shallow, sandy bits to dock your transportation and just swim along the spring, eat some snacks, etc. Be warned, it's freezing. 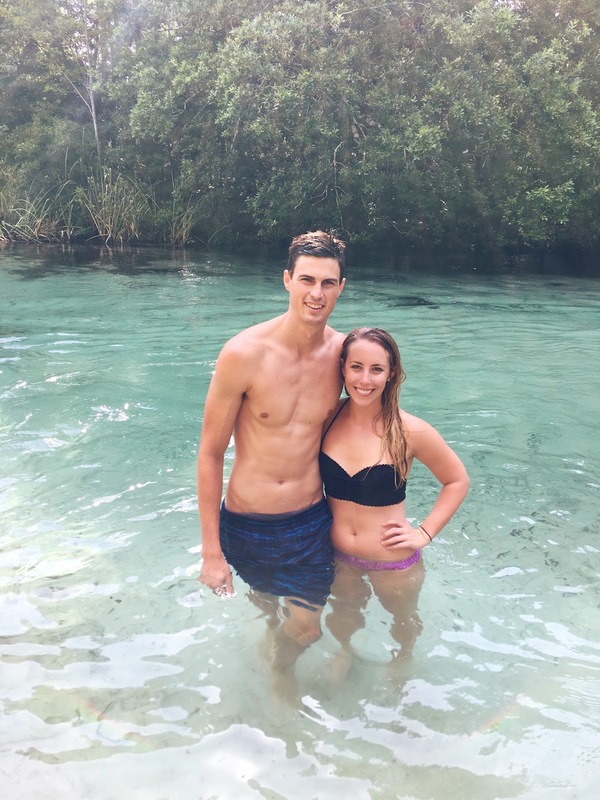 But in the middle of a hot, humid Florida summer, it felt more refreshing than cold. There were several tree swings and man made jumping platforms to launch yourself into the spring, so it's definitely worth it to make some stops. Plus, starting at 8 a.m. with "closing time" at 6 p.m., you'll want to utilize all the time you can! Needless to say, it was a beautiful day with some really great people, and it made me love and appreciate my home state even more! It's crazy to think that this was just over an hour away from where I've lived my whole life, and I'd never been. I would love to visit one more time this summer! If you're a Florida native (or even if you aren't! 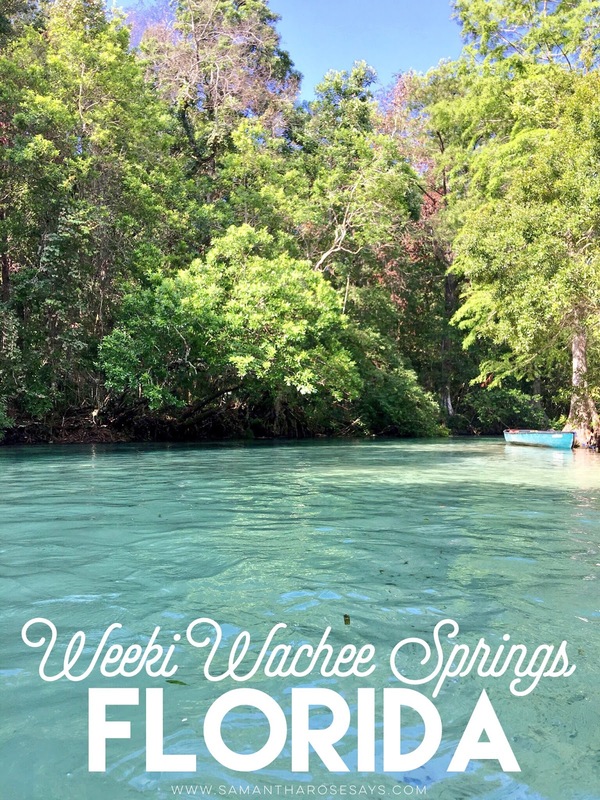 ), have you ever been to Weeki Wachee? I've always wanted to go there! It looks so beautiful. I love kayaking but I just know I would be TERRIBLE at paddle board. You should definitely go! And paddle boarding isn't too bad once you get the hang of it, I promise :) Plus at least it's a soft, refreshing fall if it has to happen, right? Let me know if you ever try! Yes to vacations like this. The water looks inviting. You sure do look like you enjoyed your time.